UPDATE, DECEMBER 23, 2015: Yachts Miami Beach is adding VIP experiences, each new for 2016. Benefits of participating include having a yacht concierge schedule onboard appointments for you. You’ll further have access to a VIP lounge, at the Ritz Carlton Residences. Dedicated car service will take you from the Collins Avenue displays to the new Island Gardens marina displays at Watson Island. If you’ll be in town early, you’ll be able to enjoy “Yachts After Dark,” an invitation-only yacht hop set for February 11 from 7 to 10 p.m. along Collins Avenue. You’ll additionally receive an invitation to the International SeaKeepers Society event being held at the Watson Island displays on February 13. Full details on the VIP package are listed at the Yachts Miami Beach website. Read on for our original story. The location is the same, but the name has changed. 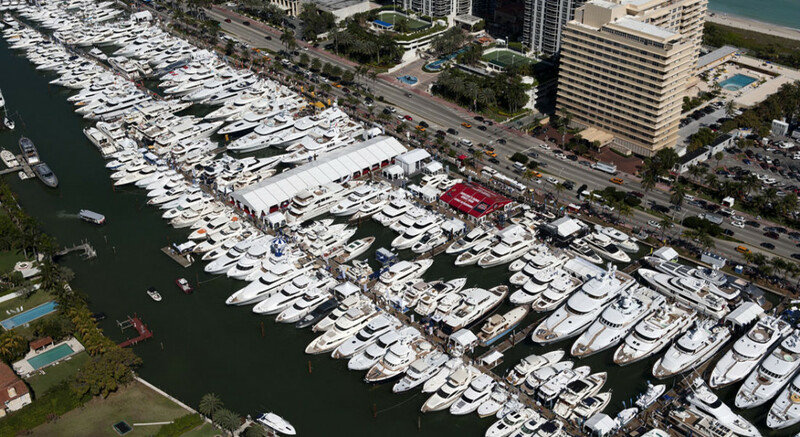 The annual Yacht & Brokerage Show, held in Miami Beach each February, is now called Yachts Miami Beach. The Yacht & Brokerage Show got its start nearly three decades ago. Throughout the years, it served as an in-water event that particularly attracted megayachts. A number of those yachts were also brokerage listings, hence the event name. Furthermore, it served as the second significant superyacht-oriented show stateside, following the Fort Lauderdale International Boat Show. (While some regional events around the country included megayachts, none attracted the number of boats or exhibitors that the Yacht & Brokerage Show did.) Over the past decade or so, production boatbuilders increasingly booked exhibit space, too. While some of their offerings have been on the smaller end of the scale, many have been about 50 feet (15.2 meters) and larger. Those builders and boats, as well as megayacht builders and their yachts, remain the draw for Yachts Miami Beach. Being held February 11 to 15, the event is expected to feature more than 500 craft all together, the customary figure. In terms of megayachts making their debuts at Yachts Miami Beach, expect to see Lady M, by Benetti. We’ll have more news on additional megayacht debuts as the details become available. Those details will include yachts docked at the new Island Gardens marina on Watson Island. That marina, in development for a few years, is focused on megayachts, both power and sail, to more than 500 feet (152.4 meters) LOA. The Collins Avenue displays cannot accommodate deep-draft yachts nor ones generally exceeding 150 feet (46 meters). That’s why Show Management, which co-owns Yachts Miami Beach, announced plans in 2014 to expand to Watson Island in 2015. The marina was still under construction during the event earlier this year. Just three megayachts were there as well. The developer has pledged to have the marina completed by the end of this month. Yachts Miami Beach will have shuttle buses taking attendees between the two locations come February.